B&O’s first cassette machine. Designed to match the Beomaster 901 (though the cabinet was slightly taller, noticeable if they were stood side by side) and available in matching colours, the compact cabinet displayed a marked departure from the big open reel machines such as the Beocord 1200. The cassette mechanism was made by Vortex in Japan, and used a synchronous mains motor from Matsushita. A permalloy head was fitted, and was uncharacteristically mentioned in large letters on the cassette lid! 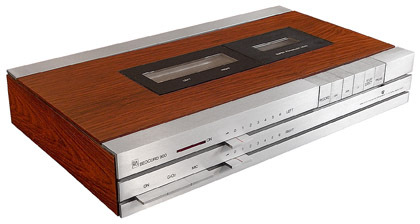 The Beocord 900 was compatible with Chromium dioxide tape, but strangely the switch on the front of the machine only worked on record, equalisation remaining unchanged on playback, giving enhanced treble response. There was also a built in microphone amplifier, though it was only mono. Text copyright © Beocentral. Unauthorised reproduction prohibited.